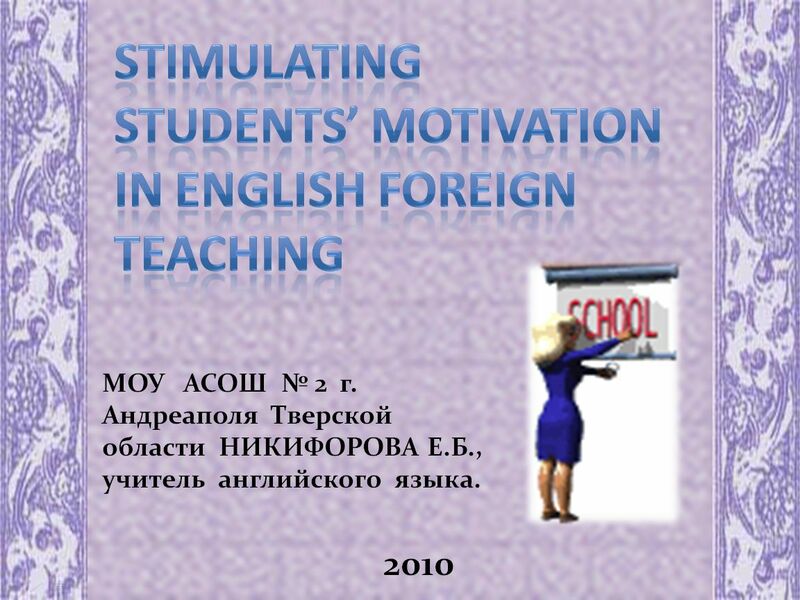 What can language teachers do to increase and maintain students’ level of motivation? A relatively small number of students get a sense of intrinsic satisfaction from learning English. For the vast majority of people, language is not very interesting, and it is unlikely to spark and to sustain motivation. have a positive impact in raising the motivation of the pupils – but the effect is usually temporary, and once they return to normal classroom work, the effect wears off. In general, the learner’s natural interest is not, therefore, something which we can rely on to generate sustained motivation in language learning. Aware of these facts, many teachers, and whole educational systems, turn to a second source of motivation, extrinsic reward, as a means of motivating students. For the failing student to get rewards, it does not take long to work out because there is always someone else who gets the rewards – no matter how hard he or she works. In this case, the reward system itself can be demotivating for the weaker students. The increase in the motivation of the better students is more or less proportional to the decrease in motivation of the weaker students. As human beings, we generally like what we do well, and are therefore more likely to do it again, and put in more effort. If we put in more effort, we generally get better, and so this sustains our motivation. Feelings of being able to do something and feelings of sustained motivation can therefore be linked into an upward spiral which causes us to commit ourselves to what are we doing and to improve. Few people like to fail and we generally avoid circumstances in which we anticipate failure. In the classroom, this can mean that students who develop an image of themselves as ‘no good at English’ will simply avoid situations which tell them what they already know – that they aren’t any good at English. Feelings of failure, particularly early on in a student’s school career, can therefore lead to a downward spiral of a self- perception of low ability – low motivation – low effort – low achievement – low motivation – low achievement, and so on. It is the existence of these upward and downward spirals in the motivation-ability relationship that explains a situation commonly found by teachers. In many classes where there are differing levels of student ability, the gap between the ‘weaker’ students and the ‘stronger’ students appears to get wider and wide over time. The attempt by some students to avoid recurring failure suggests that we need to rethink some of the beliefs that we may have about them. It is their sense of self-esteem that is at stake here. By pretending that they aren’t interested and don’t want to learn, they can protect themselves from seeing themselves as failure. For many students, the spiral will have begun long before, as they learned to see themselves as failures, and then began to engage in various kinds of avoidance strategies – sitting at the back of the class, choosing a seat where they wouldn’t be noticed, misbehaving, pretending illnesses at crucial moments such as tests, and blaming failure on the teacher or the school or other students. We shouldn’t underestimate the importance of self-esteem and a sense of confidence in language learning as crucial factors affecting motivation. For the failing student, in particular, it is important that we try to develop their sense of success and a feeling that they can do something, rather than a feeling than they can’t. how will the weaker students feel if they can’t do this? There is a psychology involved in everything we do in the classroom, and that this is concerned with the students’ feelings of success/failure, high/low self-esteem, high/low confidence and this has a direct impact on motivation. Viewed in this way, we maybe able to understand some of the reasons why, over time, motivation may fail. Where we see students beginning to fail and beginning to lose motivation, one route to repairing the situation may lie in choosing tasks which we believe the students can do, in order to develop a sense of competence and confidence. It also suggests that all students need to feel a sense of progress and that their efforts actually lead to results. work well for student motivation. Students love getting a piece of candy from the teacher's candy jar, or even a day of no homework because of good classroom behavior. Student motivation can be achieved simply when the teacher gives excellent marks, it increases their sense of self-worth. A teacher commending a student for a job well done can greatly motivate a student. By giving positive feedback, a teacher can let a student know that they are doing well and can also suggest how a student can improve on any weaknesses. Through feedback, a student will understand what the teacher expects. Chose tasks that give students more ‘psychological space’ to plan their own work, set their own pace, make their own decisions about how and what they do. For example, process writing and simulations. Tasks that different people can respond to in different ways, where the absence of a ‘single right answer’ means that everybody’s work can be valued. For example, making posters, writing poems, creating designs and describing them. 5. Involve students in classroom decision-making. Many of the decisions that teachers make can often be shared with the students, without any risks to the course as whole. You might be able to share decisions about when homework is set, how long they will spend on a particular task, what they will do next lesson, and so on. 6. Find out what students think. Find out if students think they need more practice, if they have suggestions of their own, if they find things easy or difficult, boring or interesting. You could place a ‘suggestion box’ in your class, or write an open-ended letter that students could complete with their ideas, or devise short questionnaires. 7. Think about how you give feedback and what you give feedback on. If you can identify students who are beginning to sink, try to identify aspects that you can praise and encourage. Instead of just giving a low mark, explain to the students, in concrete terms, what they could do to improve it next time. 8. Communicate a sense of optimism in learning. Communicate a belief that everyone can learn. Encourage students to try, to take risks without fear of losing marks or feeling stupid. Show them how much they have learned. Offer help as they ask for it. Students also benefit when a teacher is motivated to teach. 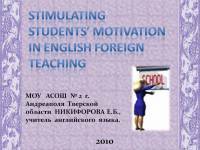 Teacher’s enthusiasm increases students’ motivation. When a teacher shows excitement about a subject, he or she can motivate students to learn. The teacher should make his classes interesting and vivid. The teacher must be fair, treat his students equally and as far as possible understand and act on aspirations of his pupils. The teacher himself must be a model of speaker of the target language. The teacher should be a skillful organizer and good at stimulating the students into the activities of the learning language.